Perhaps that’s an overly dramatic title. More than likely, you don’t even know what I’m talking about. That’s because I have a little secret and today is the day that I kill that secret like a mean old meanie head. 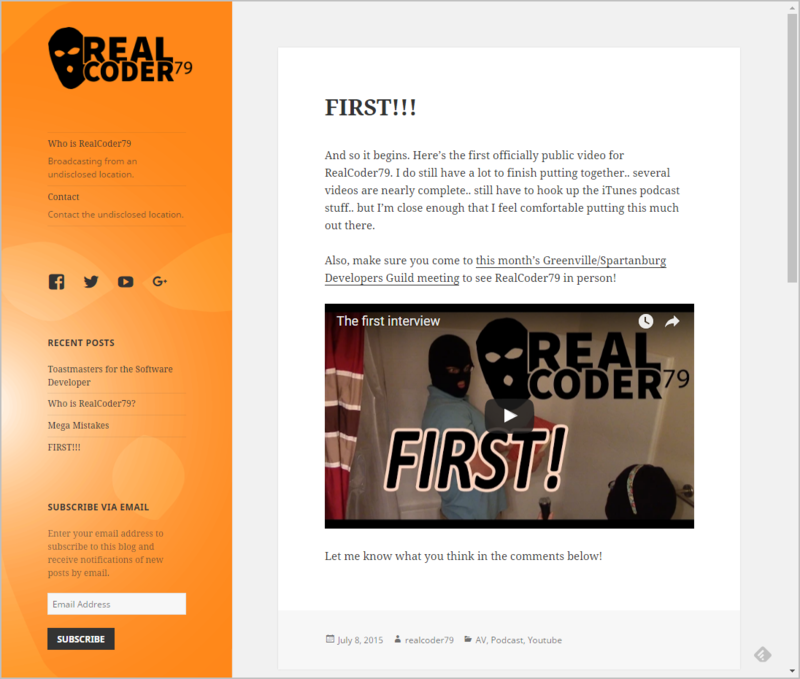 On July 8, 2015, I quietly, secretly released a side project to the world… RealCoder79. For historical purposes, here’s the contents from the about page on what was www.realcoder79.com. Okay, first thing’s first. I am not a terrorist. I did not just rob a bank. I don’t secretly have a huge zit on my face. And I’ve never hunted waskally wabbits. I’m a programmer… a software developer.. a software engineer… a software architect.. a coder… Whatever YOU want to call it. And I’m not talking about those… wizards of coding… those legends of our era that are always painting a picture of who we’re supposed to be.. You know who I’m talking about. They relentlessly drown us in the rights and wrongs of coding. They create massive volumes of impeccable code over a single weekend and their presentations are like action movies where the main character is invincible.. It’s like these people don’t even have bosses?!?!? No, I’m the real-world coder. I’m the n00b within YOU that you’re hiding from your boss. I’m the voice of your frustration that you dare not speak. I’m the coder that doesn’t always test his code…. I’m the coder that accidentally writes horrible bugs into the program. I’m the coder that severely under estimates how long something is going to take to complete. I’m the coder that sometimes isn’t able to accomplish a single productive thing all day. I’m the coder who wants to code like his idols, but his wife wants him to come to bed and the kitty litter isn’t going to scoop itself. My mission is to blur the lines between those who do the impossible, and those who have spent an entire day trying to find the other end of a mismatched bracket. Join me as I bring those coding gods down to earth, and let me help you on your journey toward becoming an awesome coder. July 13, 2015 was the last post I made on www.realcoder79.com, and I’m shutting it down today. Creating RealCoder79 was a great experience. It took months of preparation, creating the logo, the brand, the persona, the intro video, the infrastructure, the social media connections, and countless other tidbits. And then, of course, there’s all the money I spent on the audio/video equipment and software required to make it all happen. But it never really became what I had hoped it would. I’m sure it’s my fault. I still believe there was potential, but I never really marketed it as I should have. I doubt Scott Hanselman ever watched a single RealCoder79 video and that was RealCoder79’s primary objective! That was the hook I created to propel this project into the mainstream, but I never even tried to make it happen. Admittedly, I was seeing things through the wrong eyes. We’ve probably all done it before.. Spend a ton of time creating something, and then put it out there only to find that it doesn’t magically propel itself to the front of the internet… We tell ourselves that we failed without seeing the truth in the matter… that sometimes, when you think you’re 80% done, you’ve still got another 80% to do. I knew it the whole time.. and yet I held on to the project for almost a year after the last post I made. Needless to say, I learned a lot. The bigger question is, will anyone even read this post?